Wind farm noise: why is no one listening? Do wind farms really create a noise nuisance? Can they disturb the sleep of people living close by? Do they cause longer-term ill health? It depends who you talk to. The Government Department of Energy and Climate Change (DECC) denies a problem exists. When granting planning permission for a wind farm the Planning Inspectorate relies on a fifteen year old noise assessment methodology known as ETSU-R-97 (ETSU) and we are not aware of them ever turning down an application based solely on its potential to cause noise nuisance. Yet, acoustics expert Mike Stigwood of MAS Environmental, one of the few consultants to act for local authorities and resident groups, is aware of 70 wind farms in the UK causing noise nuisance. However, the wind industry trade association, RenewableUK (RUK) routinely uses its lobbying muscle to divert public and government attention away from the noise issue and, in particular, amplitude modulation (AM), the most intrusive feature of turbine noise and the cause of most noise complaints. So who is standing up for local residents against these powerful forces? I love the idea of having an entire society completely powered by water, wind and sun. I don't like the idea of drilling for oil or burning coal. It seems to me that oil is the planets natural lubricant and we're just sucking it up out of the ground. Coal just seems a dirty business that is no longer necessary. I just think that if we've got wind, we should use it and if we've got water, we should use that too. If we lived in a place where it was sunny all year, I think we should use that natural resource too. But then, I also think that in Bygdsiljum, we're probably all powered by the electricity that's generated from the water in the village and that what we don't use is sent up or down the road and it powers other villages. I don't know this for sure, but I'd guess we're pretty self sufficient when it comes to electricity usage and that we also make money for the power company. But I don't know for sure and it can be spun in many ways. 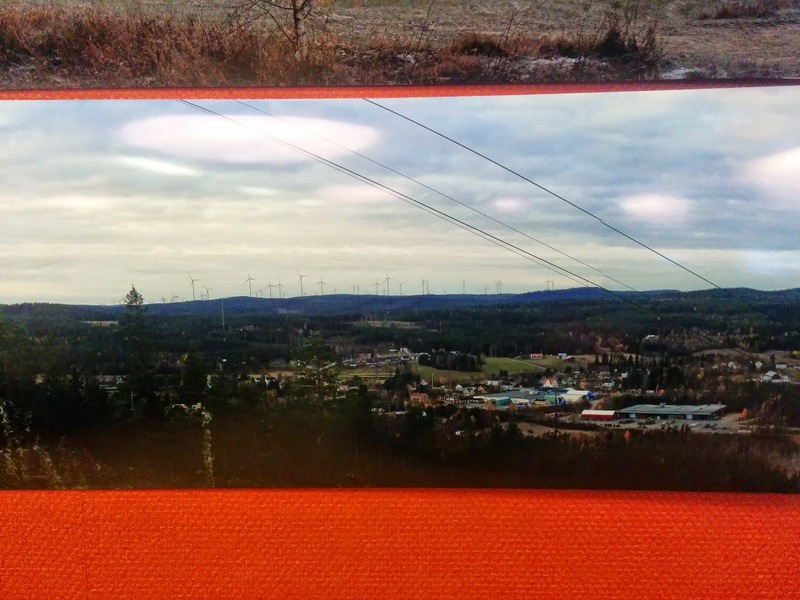 What I do know for sure is that if 70 wind turbines go up around Bygdsiljum the vast majority, if not all, of the power is going to be sent a long way away from Bygdsiljum and the only people that will benefit are Holmen shareholders. And I'm not a Holmen shareholder and I'd bet a fair amount of change that if these were proposed anywhere near the homes of Holmen board members, none of them would want it to happen ... despite what they would say. But I like, scrap that, I love the idea of generating our own power. But like I said, we already do in Bygdsiljum. So, my gut is leaning towards the, I'm not sure if I like this in my back garden feeling. I know why Holmen like it though. They'll be close to the grid so it wont cost that much to get the power onto it. I'm not sure if that makes me a hypocrite but I know I don't feel entirely comfortable taking this stance. And don't be misled, Holmen will make millions from these. But I'm just not sure if hearing and seeing them is going to make my conscience clear, especially when I know Holmen are not doing it because it's good for society or the planet. It's an opportunity for them, nothing more. And there is also a good chance that I wont be visually affected by these when in my house watching TV or working, but I think there is a good chance I'll see them when outside and a very good chance I'll see them when I'm out and about. And in terms of noise, can I live with the constant humming even if I know that we're doing something good? And maybe, just maybe I'll not be affected by the noise and I'll get used to it eventually. Anyway, I went to the meeting tonight and took a couple of photos. 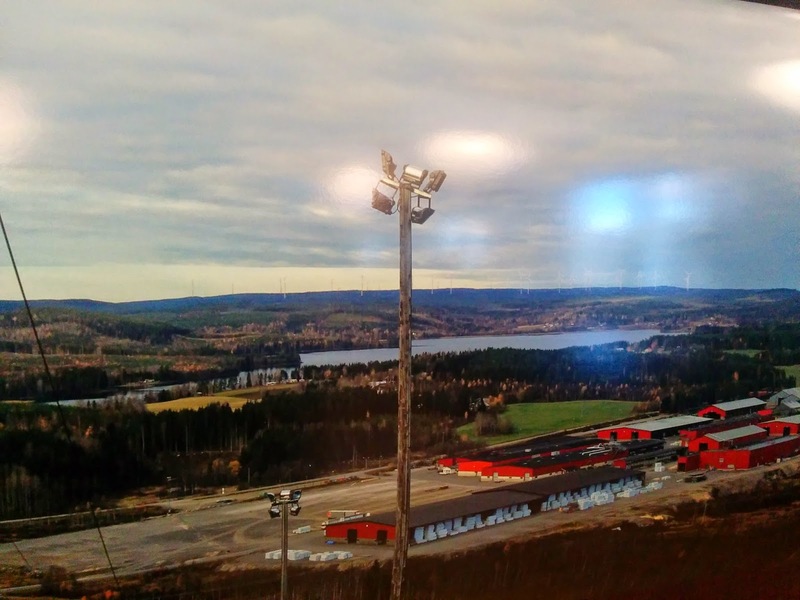 I didn't stay because it would be lost on me, but I did learn that nobody has come to Bygdsiljum to check on current noise levels and that they're using a model sent by Holmen to calculate what they think the noise will be for residents. I also learnt earlier today that no decision was made on this happening yet, but tonight the man I spoke to told me that it's likely to happen. I guess that is what the people of Ljusvattnet were told, but they are fighting it too. So, because I didn't stay, I've asked him to send me the sound model data they've used to calculate these findings, the original images that they've used to demonstrate height and also what sort of compensation plan they have for residents that will have to live with the noise, potential sleep disturbance and psychological distress (especially when you consider we live in an area with very little background noise usually), loss in property value and possible health issues that can arise from having these close by. He said it would be two or three weeks before he would send these, which if I'm honest, I thought a little long as it's information I'd have imagined they would have because they wrote the report that says this is a good place to have these wind turbines, but still, it's two or three weeks without the information so they can have time to prepare something I guess. In the meantime, these are the very bad images I took with my phone, but the turbines are clear for all to see and I guess they'll be clear to hear too in the future. Click them to make them bigger!